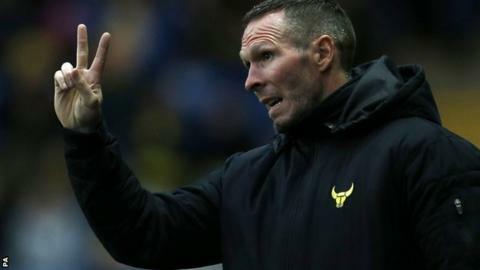 Oxford United boss Michael Appleton expects to add to his squad before the emergency loan window closes. Clubs can bring in players on loan deals ahead of next Thursday before the window closes until the new year. Oxford's strength in depth has been tested in recent weeks with a busy fixture schedule and injuries and suspensions to first-team regulars. "With one or more new additions, we can continue in our strong position," Appleton told BBC Radio Oxford. The U's are second in League Two, through to the FA Cup second round and into the southern section semi-final of the Football League Trophy. "The window doesn't shut for a week, but I'm most definitely looking to bring someone in," Appleton added. "The reality is in the periods before the window reopens, if we do pick up one or two injuries, very, very quickly we can be in a different position." Appleton admits a deal to bring winger Jordan Graham back on loan to the Kassam Stadium is firmly in the hands of his parent club Wolves. "I think Wolves are going to make a decision on him after the weekend," he said. "The way things are, I wouldn't be surprised if he plays for them at some point over the next week or so."